A test program called Homeless Hotspots — described as a “charitable experiment” by creators BBH Labs — takes members of Austin’s homeless population and equips them with 4G MiFi devices. Wearing t-shirts that read “I’m (Name). I’m a 4G Hotspot,” they collect donations from users for the connection. 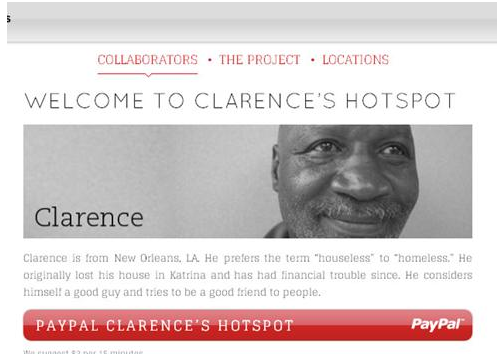 The official website for Homeless Hotspots suggests $2 for every 15 minutes, but BBH’s Saneel Radia says in a blog post users can pay as much as they want. Listen to one human hotspot working the South by Southwest conference.